Do you like the concept of OnStar, but hate the fact that it’s only offered on GM vehicles? Do you yearn for that little blue button on the rearview mirror in your Honda Accord? According to Jalopnik, there’s good news: OnStar is poised to launch OnStar Anywhere, their first foray into the aftermarket accessory business. The $299 (excluding installation charges) mirror will include most of the features found on the GM version, less a few that require significant vehicle integration. You’ll get stolen vehicle tracking, for example, but OnStar Anywhere won’t have the capability of shutting down your stolen car. Lock your keys inside (which is nearly impossible with modern keyless entry vehicles), and OnStar Anywhere won’t save your bacon. Auto Crash Detection and Response. Using a series of accelerometers in the mirror itself, OnStar will be notified if the sensors detect a significant frontal, rear or side impact. What happens when your OnStar Anywhere equipped Dodge Viper pulls over a G in a corner? I guess we’ll find out soon enough. Emergency Assistance. Just like the GM version, hitting the red “panic button” will connect you to an OnStar emergency operator. Stolen Vehicle Locator. Like the GM version, OnStar Anywhere will tell police where your stolen car is. It’s not capable, however, of shutting it down. Turn-By-Turn Navigation. OnStar Anywhere will provide spoken directions, but it won’t give you the arrows or text on the dash information display provided by the fully integrated version. Roadside Assistance. Break down by the side of the road, and help is just a push of the blue button away. Bluetooth Integration. OnStar Anywhere provides hands free calling when integrated with a mobile phone. If you are one of the five people in America without a mobile phone, you can also buy pre-paid minutes and use OnStar Anywhere as your mobile phone. OnStar claims that OnStar Anywhere will work with 99% of the 20 best selling, non-GM cars of the past ten years. In other words, installing it in your Toyota Camry, Ford F-150, Honda Accord or Nissan Altima shouldn’t be a problem. Hooking up your Ferrari F430, on the other hand, may pose a few challenges. Look for OnStar Anywhere to hit consumer electronic retailers within the next few months. Las Vegas, Jan. 4, 2011- OnStar today announced that it is responding to repeated consumer requests by offering its industry leading safety, security and connectivity services for non-GM and older GM vehicles already on the road. A standalone rearview mirror packing all of OnStar’s core technology will be available this spring through consumer electronics retailers, and is compatible with most top-selling vehicles from major manufacturers. 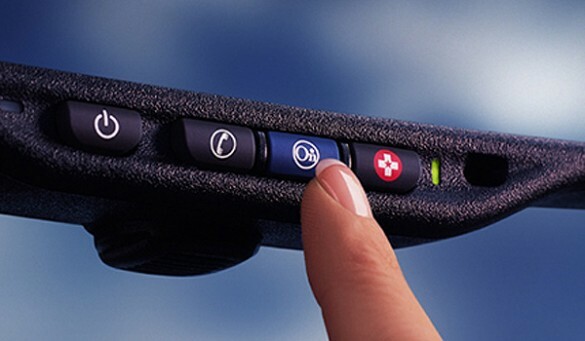 The OnStar retail product offers the key features that have made OnStar’s “blue button” an icon, including Automatic Crash Response, Turn-by-Turn Navigation, Stolen Vehicle Location Assistance, one-button access to emergency and roadside services, and hands-free calling, including Bluetooth connectivity. OnStar will offer the mirror in the United States through Best Buy, its first strategic retail partner, beginning in spring 2011. The product will also be available through other selected consumer electronics retailers. The mirror will be priced at $299, plus installation (expected to cost between $75 and $100). A range of service plans will be available, starting at $18.95 a month or $199 a year. Ingram Micro will serve as the key distributor of this product and is the main contact for interested retail outlets. Currently, the OnStar mirror is certified to work on 99 percent of the top 20 selling non-GM vehicles over the last 10 years, or approximately 55 million cars and trucks. OnStar expects to certify additional models in the months ahead. * Automatic Crash Response. An accelerometer built into OnStar the mirror detects the sudden shock of an impact from the front, side, or rear of the vehicle and automatically calls an OnStar advisor. If the driver doesn’t respond, or responds to say there has been a crash, an OnStar advisor will direct emergency responders to the exact GPS location of the vehicle. * Link to Emergency Services. By pressing OnStar’s red emergency button, drivers are immediately connected to a specially trained emergency advisor for assistance in situations occurring inside or outside of their vehicle. * Stolen Vehicle Location Assistance. If the vehicle is reported stolen to local law enforcement, OnStar subscribers can call 1-888-4-OnStar (1-888-466-7827) from any phone. OnStar advisors, available 24/7, can attempt to locate the vehicle through the mirror’s internal GPS and provide the location to law enforcement. * Turn-by-Turn Navigation. With OnStar’s most popular service, drivers can press OnStar’s blue button and ask OnStar advisors for directions to a specific location or ask the advisor to find a point of interest such as a gas station or nearby restaurant. The directions are then downloaded to the OnStar system, which provides spoken turn-by-turn directions for reaching the destination. * Roadside Assistance. In non-emergency situations, drivers can push the blue button or call 1-888-4-ONSTAR for help with problems such as keys locked in the vehicle, a flat tire, or running out of gas. * Hands-Free Calling. OnStar allows drivers to make hands-free, voice-activated calls either through a Bluetooth connection to the driver’s mobile phone or through prepaid packages of minutes purchased through OnStar. All these services are available directly through the OnStar mirror, without requiring the driver to bring along a mobile phone or even own a mobile phone. In the event of an accident, emergency services are alerted even if there is no mobile phone in the vehicle, the phone is damaged in a crash or the driver is unable to use a phone. OnStar is now in its ninth generation of technology. The first-generation OnStar product in 1996 was comprised of 38 individual components and could take up to four days to install. Now all of the technology required to deliver the OnStar experience fits inside a rearview mirror weighing only 23 ounces, and professional installation is expected to take less than an hour. This requires removing the vehicle’s current rearview mirror, replacing it with the OnStar product and running an electric power source to the new mirror. For more information on OnStar’s innovation, the new OnStar mirror and a list of the compatible vehicles at launch, visitwww.onstar.com. OnStar, a wholly owned subsidiary of General Motors, is the leading provider of connected safety and security solutions, value-added mobility services and advanced information technology. Currently available on more than 40 MY 2011 GM models, OnStar soon will be available for installation on most other vehicles already on the road through local electronics retailers, including Best Buy. OnStar safely connects its more than six million subscribers, in the U.S., Canada and China, in ways never thought possible. OnStar Stolen Vehicle Slowdown is a recipient of the 2010 Edison Award for Best New Product in the technology category. More information about OnStar can be found atwww.onstar.com.